As Pinterest reportedly prepares to go public sometime next year, new data from YouGov BrandIndex reveals that US adults have held a relatively stable view of the visual-driven online brand since early 2016. This period of relative calm, with no significant gains or drops, follows a three-year increase in consumer sentiment, especially among women. In January 2013, Pinterest’s Impression score — which asks respondents if they hold an overall positive or negative impression of a particular brand — sat at 13 among all Americans aged 18+. By January 2016, this figure had more than doubled to 28. Since then, Pinterest’s Impression score has largely maintained its position. 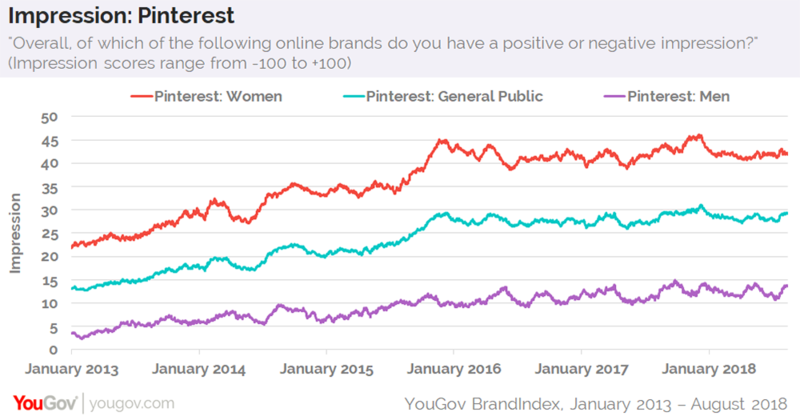 Women have consistently reported a more positive opinion of Pinterest than men. At present, the numbers show a 28-point gap in Impression scores, with women at 42 and men at 14. Pinterest’s Satisfaction score — which gauges how satisfied or dissatisfied consumers are with a particular product or service — has followed a similar trajectory of growth prior to stability. In January 2013, Pinterest's Satisfaction score among US adults was 9 before climbing to 22 over the course of three years, where it remains today. 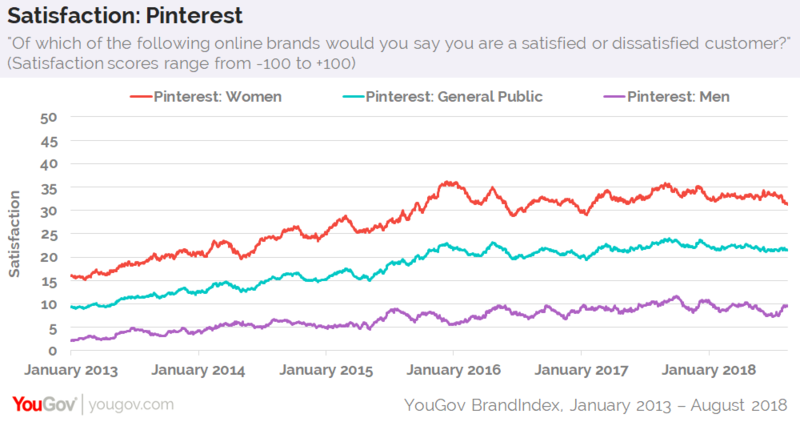 Yet again, female users report higher levels of satisfaction with Pinterest than their male counterparts. The present 22-point spread in Satisfaction scores between the sexes, however, is slightly smaller than the 28-point difference in Impression scores. According to Pinterest’s own statistics, the website currently attracts over 200 million people each month. Data from YouGov Profiles shows that US adults who visit Pinterest at least once per month tend to access the site via smartphone (67%), followed by laptop (37%), tablet (25%), then desktop computer (23%). Four in ten (40%) monthly users say they visit the site to share things they find interesting or entertaining, while one in five (19%) do so to keep up to date with brands they like.